One of the Apple Pay features touted with iOS 9 was support for new types of cards including store-branded credit cards and loyalty rewards cards from retailers. Just yesterday, department store chain Kohl's became the first retailer to launch Apple Pay support for its store-branded credit card, and it now appears Walgreens is preparing to launch support for its Balance Rewards loyalty rewards program. 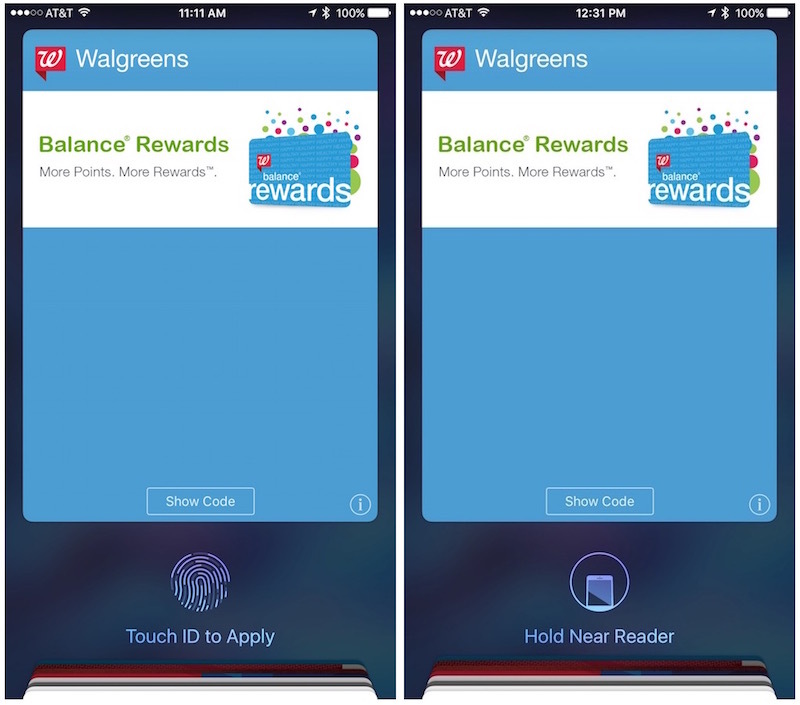 Balance Rewards members have for some time been able to sign into their rewards accounts using the Walgreens iOS app and add their Balance Rewards numbers to the centralized Passbook/Wallet app. From there, it's been easy for users to bring up the Walgreens pass to display barcodes that can be scanned at checkout to make sure they receive rewards credit for their purchases. As noted by several MacRumors readers, however, the Balance Rewards card in the Wallet app is now showing up as supporting NFC via Apple Pay. Double-clicking the iPhone home button to bring up Apple Pay cards offers access to the Balance Rewards pass, where the user is then prompted to authenticate with Touch ID and hold the phone near the NFC terminal at the register. Users can also opt to show a barcode for scanning if needed. While the interface on the iPhone shows all signs of being ready to use Walgreens Balance Rewards via NFC, we and several readers have been unable to successfully use it in-store, as it appears Walgreens' payment terminals have yet to be upgraded to accept Balance Rewards using that method. In our testing yesterday, attempting to transmit a Balance Rewards card to the terminal via Apple Pay simply generated an error on the terminal noting the system was requesting a method of payment. Walgreens Balance Rewards is also showing up as an Apple Pay option on the Apple Watch. Double clicking the side button of the Apple Watch to bring up available payment cards shows a Walgreens card that appears ready to use via NFC but similarly is not accepted by the terminal. 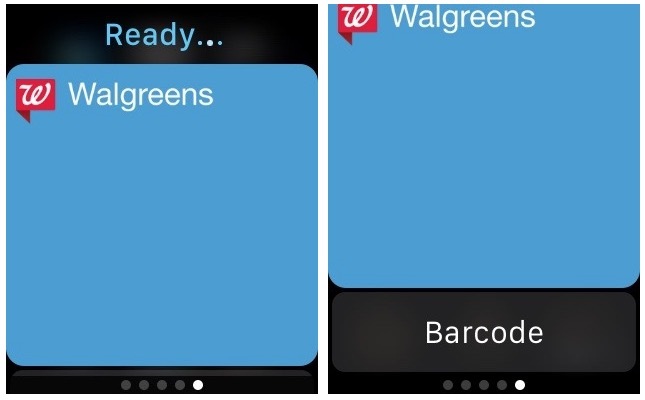 A barcode option as seen when the Walgreens pass is accessed directly from the Apple Watch's Wallet app is also available through the Apple Pay mechanism, although the overall presentation of the Walgreens card feels unfinished as it requires scrolling to access the barcode button via Apple Pay. Late yesterday, Walgreens announced it plans to acquire rival Rite Aid in a deal that is expected to close in about a year to combine the largest and third-largest pharmacy chains in the United States. Rite Aid will initially operate as a wholly owned subsidiary of Walgreens with its own branding, although the two brands are likely to fully integrate over time. Walgreens was a launch partner for Apple Pay payments back in 2014, but Rite Aid famously held out due to its contractual obligations with competing payments platform MCX/CurrentC, even going as far as to disable existing NFC payment support to prevent customers from using Apple Pay in its stores. Rite Aid reversed course in August as its exclusivity with CurrentC ended, adding support for Apple Pay in its stores. Ideally I'd just want to authenticate and tap once to pay with whatever credit card I choose. To be a seamless experience, ApplePay on my phone should be able to automatically know I'm at Walgreens and send both the credit card and loyalty info with one authentication and tap. If I have to select loyalty card then apply fingerprint and tap and then select my payment card and re-apply fingerprint and tap, then this isn't really a convenience or time savings. But good news for retailers! They can get around this by bribing their customers with price cuts. That was close, people almost had privacy! Good thing that was avoided. But while I expect the stores to try this, what frustrates me more is the overwhelming support from consumers as witnessed in this very thread. Nice try, Apple, but people don't actually want privacy. It was a good effort but just so long as they can save a few pennies on soap and candy they'll hand it all right back to you. I've been using Apple Pay there for a while. Now it looks like they're expanding, buying Rite Aid. Just added my rewards card to passbook and when doing so, you're given an option to have it automatically selected when in a Walgreens store. So in theory, when I walk up to the cashier and open up Wallet, the Walgreens card should already be selected. No need to navigate to it. I usually don't give them an option to scan it. I just put my card infront of the reader myself. This will keep me from taking my card out since I'm using Apple Pay anyway. I'm confused. When I go to Walgreens my balance reward card is already in my wallet app. I just scan it there when they ask for my rewards card. So how is this different than what I have been doing? It's not all that different. Instead of scanning a barcode on the Walgreens card in the Wallet app, you'll be able to pull it up in Apple Pay and register it via NFC. Not a huge timesaver, unless like me yesterday you run into a cashier who refuses to scan your barcode and makes you type in your phone number on the PIN pad. This is good news but I just find it faster to type in my phone number at Walgreens to link up my account. Now if Apple could come out with a way where ApplePay detects I'm at Walgreens, and sends my loyalty information and credit card information at the same time, then that would be awesome. Either way, step in the right direction. Hmm ... Walgreens is known to not always enable NFC reader from the start of the order (the NFC light only comes up after cashier hit finish IIRC) so I wonder how the usage flow would be though. Will they now always enable the NFC reader? I guess there's only one way to find out. I'll give it a week or so, though. Great! Now my credit union has to stop dragging its feet and implement ApplePay already. It's more than a little frustrating. They used to only give points on prescriptions and select items that change weekly, so it was hard to get a lot of points unless you specifically went to buy those items or you get prescriptions on a regular basis. Now (since June) they have "everyday" points and you get 10 points for every dollar you spend in the store (in addition to the "special" items of the week that give you some bonus points)...makes it easier to get points from everyday items. The weird thing about ApplePay at Walgreens is that their terminals require a PIN. It's not just Walgreens. My local grocery store also requires a pin. Apparently they don't work as a Credit card, but rather an ATM.